With the government of Recep Tayyip Erdogan growing ever bolder, ever more deeply autocratic and more violent to any opposition, it comes as a welcome surprise to see such a display against him. Hundreds of thousands of Turks took to the streets of Istanbul yesterday – the largest opposition rally in years. Since last year’s attempted coup, the government has cracked down on all opposition, including politically-convenient scapegoats, leading to dismissals and imprisonment of politicians, teachers, academics, journalists and others. But yesterday’s rally acted as a defiant statement against Erdogan. 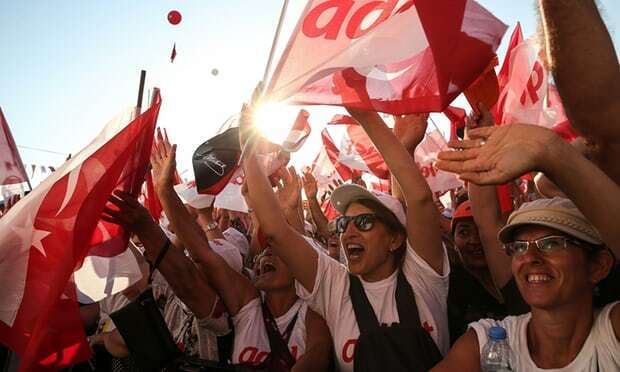 It ended in the Maltepe parade ground, and started in the capital, Ankara – a 280 mile journey which shows that opposition isn’t just the preserve of an urban elite, but has national resonance. Led by Kemal Kılıçdaroğlu, leader of the Republican People’s party – the main opposition party – the Guardian reported that the rally „appeared to draw citizens from across the political spectrum“. 249 people died in last year’s attempted coup, and more than 1,000 were injured. The protestors invoked the symbolic power of the attempted coup by staging it a year later, but largely ignored any mention of it. Indeed, their primary focus was on justice – a central tenet of thought and philosophy and law under threat all around the world, but particularly in Turkey. We stand with the protestors. Whither child brides of Africa?